Nintendo of America is upsetting fans and losing potential money in the process. Back in May, we first heard that the Nintendo World Store in New York City would be exclusively selling a Limited Edition version of Mario Kart 8 in North America. This special game variant came with the anticipated Wii U racer and a statue of the most iconic weapon in the game: a Spiny Blue Shell. Smash Bros. players with Nintendo's new hardware are in luck. We recently learned that the 3DS version of Super Smash Bros. will not take advantage of Circle Pad Pro accessories. Instead, the new portable Smash Bros. will make use of the C-Stick built into the upcoming New Nintendo 3DS hardware. The gaming community has taken a toxic and violent turn in recent months, and Karl’s wondering how the rational, compassionate, but ultimately silent majority should react. While the use of Amiibo in Smash Bros. might not be compelling, those figures do look wonderful and collectable. Back at E3 2014, I tried to unpack what Nintendo showed with Amiibo. I still stand by a lot of what I said. I think Amiibo has the potential to just be another eReader, making it the latest in a long line of Nintendo peripherals that got a major push and faded away. But there’s something that Amiibo has in its pocket that the eReader or the Balanced Board or Wii Motion Plus never had: attractive collectability. I’ve been waiting for the day. Japan's Club Nintendo gets a plush prize. It seems Club Nintendo's quality has vastly declined in every region as of late. That is, of course, except for in Japan. 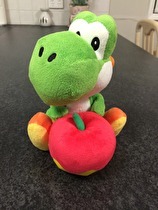 Observe this adorable Yoshi plush that recently hit the Japanese catalog for 600 points. Sitting pretty at about 18cm tall, he's firmly clutching a berry item from the Super Mario series.